Mississippi is one of our favorite Southern states to eat in. 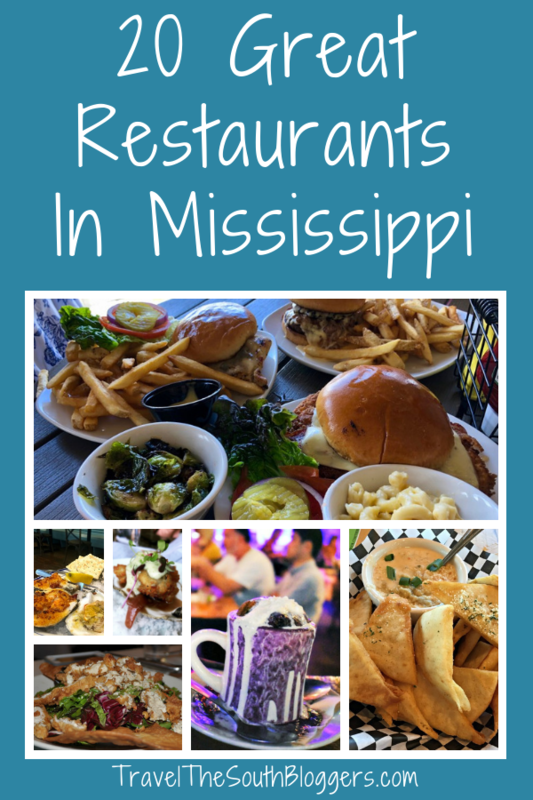 From small town local bites to fine dining classic dishes, there are so many good choices in the Mississippi restaurant scene that you will be amazed. Check out this list of 20 great restaurants in Mississippi that are serving meals guaranteed to tantalize your taste buds. The Reef is a casual, waterfront restaurant with delicious seafood dishes and affordable prices overlooking the Gulf of Mexico in Biloxi. The Reef makes their Crab Dip by adding lump crabmeat to white queso, resulting in a liquid consistency. Y’all, it was awesome! I could taste fresh chunks of crabmeat in every bite. 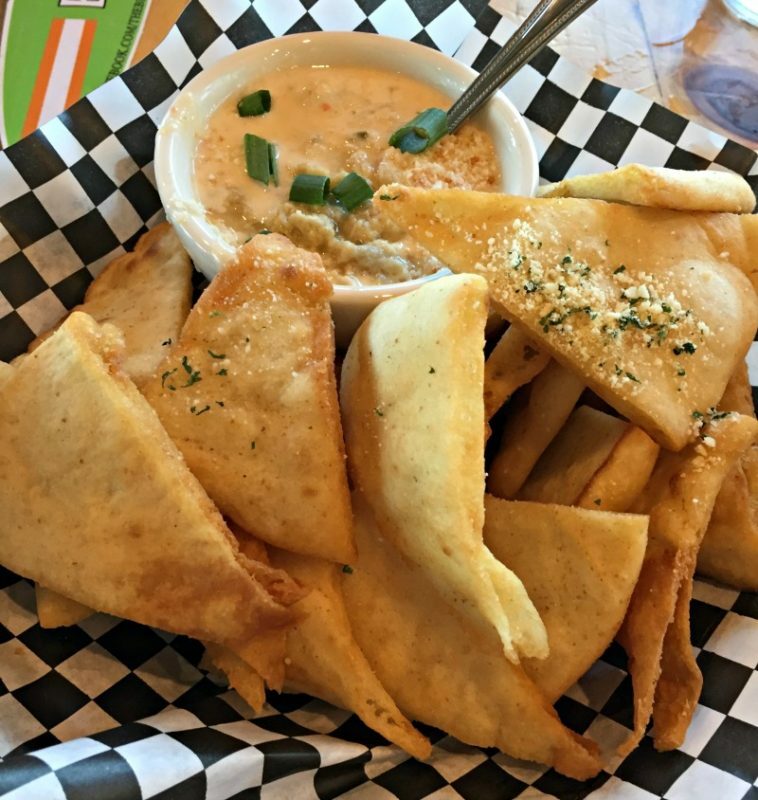 The Crab Dip came with soft, lightly toasted pita chips. Local 463 Urban Kitchen’s menu is bursting with Southern dishes, seafood, flatbreads, burgers, and Southern favorite blue plate specials. If you like mushrooms, you must try the Portobello Fries, accompanied by spicy comeback sauce (a Mississippi remoulade-style dressing). They are utterly amazing though everything on the menu is most likely going to be very satisfying. The Blue Canoe is “a laid-back, funky joint and Tupelo’s home for original live music”. It is also the #1 rated restaurant in Tupelo on TripAdvisor. Regarded as the best dessert in Mississippi, you’ve got to try Connie’s Blueberry Doughnut Bread Pudding, made with Tupelo’s famous Connie’s Blueberry doughnuts. It comes warm in a coffee mug and you eat it with a spoon. This dessert is fantastic! Brent’s Drugs is a nostalgic soda fountain in the heart of Fondren, one of Jackson’s hipster neighborhoods. It was used twice in the filming of the movie “The Help“, starring Emma Stone and Jessica Chastain, based on NY Times best-selling book. The must-eat dish at Brent’s Drugs is the velvety Brent’s Cheese Soup. No counting calories here as you enjoy, most-likely, licking the bowl. Saltine Oyster Bar is a go-to place for killer oysters from different regions of the country and Canada. Saltine is super trendy and inside of an old school-like building in a cool part of town. Try the sampling of Saltine’s three main wood-fired oysters: Alabama (drizzled with white bbq sauce), Citrus (prepared with butter, citrus, garlic, and shallots), and Lafitte (topped with a mixture of crawfish tails, parmesan, bacon, and hot sauce). These might be the best oysters I’ve ever had! Table 100 is not only a place to go for celebrations in the metro Jackson area but also where you go for a memorable meal that will knock your socks off. This restaurant is incredible! Opt for a mouth-watering steak at Table 100 with a Certified Angus Beef Filet; a whopping huge piece of flavorful meat served with Yukon mash and sauteed green beans. I had read about the Walnut Hills Restaurant in a Southern Living Magazine as well as in the “1,000 Places to See Before You Die”. It has also been featured on Good Morning America. With that much publicity, you know the products they are delivering are going to be good. My daughter and I opted for slices of layered cakes, the epitome of Southern deliciousness. Both the rich and smooth Strawberry and decadent Caramel Cakes are equally amazing and will cause your eyes to roll in the back of your head. Having the best oyster of your life is quite memorable; so the vivid memory of devouring the Joachim Oyster from Charred in Ocean Springs, Mississippi feels like just yesterday. The oyster is named after Chef Milton Joachim and is flash fried and served on the half shell, then topped with tarragon aioli and red onion marmalade. The presentation was superb. Surprising enough, I sampled this little slice of heaven on the Tasty Tours of Ocean Springs food tour. A Ridgeland fine dining restaurant that feels comfy and casual instead of stuffy and uppity is Ely’s Restaurant and Bar. Dine at the bar or reserve a table with a well-in-advance reservation and treat yourself to high-quality food and drinks at this swanky modern steakhouse. I loved the Filet Louisiane, cooked just right and topped with a life-changing BBQ creole butter. The steak melted in my mouth! A prestigious fine-dining experience in Ridgeland begins at Seafood R’Evolution, a great restaurant in the Renaissance at Highland Colony. The decor is as beautiful as the plated presentations and everything you’ll try will be memorable. Our recommendation is the unique Red Velvet Cornbread served with cream cheese butter. Holy goodness…it is sensational! When we visit Oxford, Mississippi, South Depot Taco Shop is usually our first stop. Located right off of the Oxford Square, South Depot Taco Shop is a restaurant that allows you to build your own burrito/burrito bowl/quesadilla/salad/nachos/tacos with fresh ingredients. We like to keep it simple with a classic Cheese Quesadilla and Queso Dip with homemade tortilla chips. The cheese is velvety and clings to the tortilla chips perfectly, while our quesadilla is hearty and oozing with melted cheese. Spearheaded by one of Mississippi’s finest chefs, Robert St. John, the Purple Parrot Cafe is one of his many restaurants in Hattiesburg. My favorite thing about the restaurant is the rich and creamy Corn and Crab Bisque, chock full of delicious seafood chunks. Be sure to pair the creamy concoction with Purple Parrot’s wonderful homemade bread. “A sophisticated atmosphere with a laid-back twist, The Fairpark Grill is a place that is comfortable and welcoming like a local sports bar but provides an upscale dining experience.” The Chicken Picatta is sensational. It was a superb pick! The pan-fried chicken is tossed with a light caper-lemon butter sauce and served with mashed potatoes and grilled asparagus. This is definitely a meal for a big hunger, but will delight your taste buds with a 10/10 score in taste. At Vicksburg’s newest foodie hotspot, try “That Famous” Fried Chicken Sandwich. The toppings lured me right in with spicy Pepper Jack cheese, candied bacon, and maple-chili glaze. Oh, my! What a spectacular choice. Choose the comfort food staple side dish, the Macaroni & Cheese, ultra creamy and toothsome. The 10 South Rooftop Bar & Grill is situated on the 10th floor of downtown’s First National Building. Arguably the most popular restaurant in downtown Ocean Springs is Mosaic Tapas Bar, offering a wide variety of dishes including Southern staples and global eats. Try a different take on the classic Southern Shrimp and Grits dish, fashioned with a deep and flavorful tomato caper cream sauce and served over a Southern-fried grit cake rather than plain grits. The result is unexpected and really great. I’d be lying if I didn’t add a shout out to my favorite restaurant in all of Mississippi, Ajax Diner. Try a succulent plate of vegetables (that means plenty of starches, too, in the South) or a honkin’ big piece of pie. However, the dish I’m mentioning is a full meal, sure to please a hungry appetite and a classic comfort food dish. Try the cornmeal battered Fried Catfish and pair it with tangy turnip greens, hush puppies, and the squash casserole. It doesn’t come much better than this anywhere else in the world! Sugaree’s, the cake shop in New Albany, will dazzle your eyes and tongue as you taste the most incredible and creative cakes around. My favorite is the Rainbow Cake, layered with flavors that correspond to the colors (grape, strawberry, lemon, orange, and lime) and are smothered in a rich, finger-licking-good cream cheese frosting and rainbow sprinkles. The Char Restaurant is a gorgeously decorated restaurant that has top-notch service, an enticing menu, and amazing food. I like having the Ginger Peanut Chicken Salad from The Char. Fried chicken tenders over baby greens are tossed with carrots, cucumbers, toasted sesame seeds, and roasted peanuts. The dressing really makes the salad and it is filling enough to act as the main course. Try The Char in Memphis and soon coming to Nashville, too. A catered meal that needs mentioning in the state of Mississippi was the lovely presentation of foods by The Gables in Laurel. 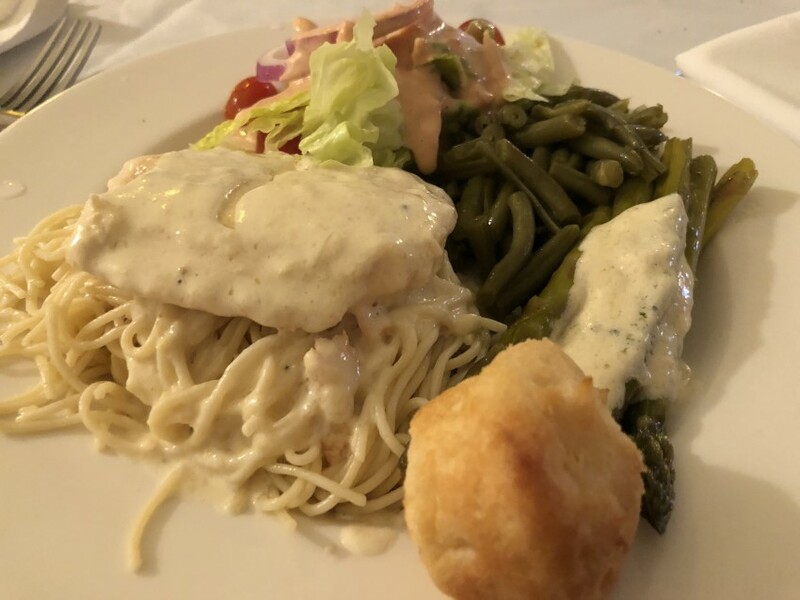 The salad and homemade dressing and perfectly cooked green beans were the perfect accents to the Salmon over Angel Hair Pasta meal (white wine lemon butter sauce), complete with housemade sour cream biscuits. Oh, heavenly day this was delish! Rockin’ some of the tastiest baked goods I’ve ever tried is French Kiss Pastries in Ocean Springs. The selection of European-inspired goodies at French Kiss is quite noteworthy, but the taste is what will win you over. 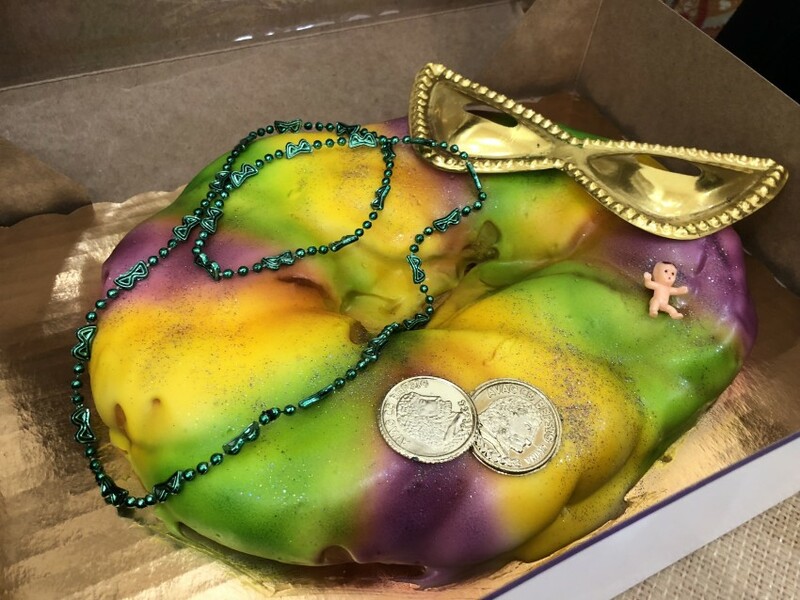 In my world, you just can’t go wrong with a King Cake. This one sets the standard for a flakey cake that is moist, full of flavor and has the right ratio of icing to cake. Bonus, it is beautiful! Which of these great restaurnats in Mississippi would you like to try first? Mark my words, while Mississippi isn’t always viewed in the fairest of light in news reports, there is no denying their culinary scene is one to be admired and indulged in. Disclosure: Some of the above mentioned meals were provided to me as part of a hosted press trip. As always, opinions and reviews are 100% my own and unbiased. Heading to the southern states on our road trip. Should be there in November so will definitely search some of these out! Awesome! Any states you are anxious to check out?